A modular free standing roof edge protection system that does not penetrate the roof membrane. One of the regulatory bodies recommendations in reducing risk taken by people working on a roof is to select and use the right rooftop safety equipment. 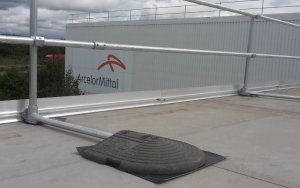 For contractors and engineers accessing flat roofs to carry out essential building, repair and maintenance work, safety guardrailing afforded by collective roof edge protection system can make a major contribution to minimising danger. The collective system that is selected must meet the highest safety standards. Our KeeGuard® rooftop guardrail system is fully tested and meets or exceeds current rooftop safety requirements. Not all free standing roof edge protection systems offer this level of security of rooftop areas. KeeGuard® is a modular free standing rooftop guardrail system which does not penetrate the roof membrane. The system works on a proven counterweight system, recycled PVC weights provide high visibility, non-slip secure base that does not penetrate the roof membrane. Galvanised fittings and tube deliver collective protection which ensures a safe working environment for anyone working on a roof. The KeeGuard® roof edge protection system offers maximum flexibility for most rooftop configurations, almost any flat roof up to 3 degrees can be accommodated. The system is available for different roof types, either for use where a restraining wall such as a parapet is in place or where the rooftop is completely open around the perimeter. The KeeGuard® rooftop guardrail system can be used for retrofitting to older buildings as well as for new constructions. The KeeGuard® systems is also available in a lightweight aluminium version. There is also available a KeeGuard® Foldshield folded version and a unique, fixed roof edge protection system named KeeGuard® Topfix especially designed for standing seam metal roofs. For roofs with a limited space we offer KeeGuard® Premium - the system which does not require counterweights along the full run of the system. This provides the ideal solution for areas where traditional counterweights are unsuitable or potential trip hazards are a concern. Summary: Provide and install freestanding KeeGuard® Roof Edge Fall Protection System, including tube railings, bases, counterweights, fittings and delivery to site. Reference: EN14122 Part 3 & EN13374 Class A, all applicable, local and national codes. Tube for handrails, mid-rails, uprights and counterweight connection is to be galvanised mill finished to the requirements of EN ISO 1461. Kee Klamp® Components shall be galvanised to meet EN ISO 1461. All tube connections to be Kee Klamp® structural tube components manufactured to the requirements of EN1562/1563. Railing assembly shall be capable of withstanding a load of 300 N/m applied at any point on the top rail. Test in accordance with EN 14122 part 3. Shop drawing; Indicate profiles, sizes, connections, size and type of fastners and accessories. Rails and Posts: 48.3 OD steel tube, galvanised. Kee Klamp components: Elbows, Crossovers, Wall flanges, Tees, Couplings, galvanised. Mounting Bases: Iron bases are galvanised and are supplied with a rubber pad on underside of the component. Fasteners: All fasteners shall be stainless steel. For all connections with Kee Klamp® Components, each set screw is to be tightened to 39 N/m of torque. Placement of uprights and counterweights to manufacturer specifications as stated in the KeeGuard® Installation Instructions. Terminate the run as stated in the KeeGuard® Installation Instructions. Freestanding counterweighted guardrail system with 1.1m nominal height to provide a barrier on the roof which withstands a load of 300 N/m applied to the top rail per EN 14122 Part 3. Acceptable low slope, roof edge fall protection to be KeeGuard® manufactured by Kee Safety Ltd.